(Photo courtesy of Josh Ewing, Friends of Cedar Mesa) This prehistoric masonry structure, near southeast Utah's Recapture Canyon, is on one of many parcels rich in archaeological resources that the Bureau of Land Management is leasing for oil and gas development. Historic preservationists are fighting the Bureau of Land Management’s sale of new leases in southeast Utah for oil and gas — including, they say, a wealth of archaeological treasures embedded in the landscapes around Recapture and Montezuma canyons and Alkali Ridge. 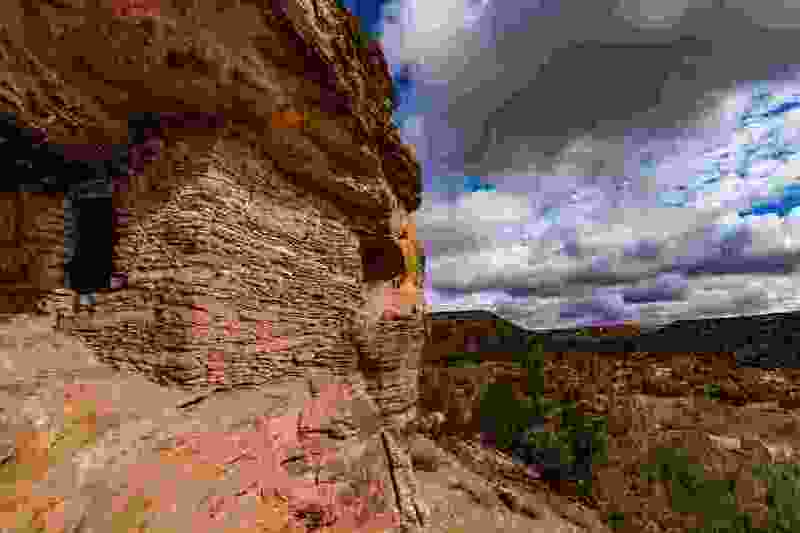 None of the controversial public lands offered for leasing are within the former boundaries of the Bears Ears National Monument, but some are close enough to Hovenweep and Canyon of the Ancients national monuments that the U.S. National Park Service asked its sister agency to pull some parcels off the block. Four are near the Bears Ears’ former northern reaches and a fifth abuts the San Juan River. At the BLM’s quarterly online auction Tuesday, the federal agency secured bids on all 43 parcels— covering 51,483 acres— offered in San Juan and Grand counties. Three years ago, the BLM planned to lease lands in the same area, but changed course after it was advised that leasing could result in “adverse effects” to historic properties it is obligated to safeguard, yet had not fully inventoried. The same logic should apply to the leases sold Tuesday, said Josh Ewing, executive director of Friends of Cedar Mesa, based in Bluff. These contain the remains of seven large masonry structures built by prehistoric Anasazi as community centers centuries ago. Ewing called the auction “an important precedent,” given that the parcels in question are dense with archaeological resources. Some of the lands have been drilled in the past and have not produced much. The BLM did agree to “defer” a leasing decision on three San Juan County parcels at the request of the Navajo Nation, which owns the surface and objected to leasing the underground minerals at that location. At a protest Tuesday in front of the BLM’s Salt Lake City headquarters, Mark Maryboy, a Navajo who has served on the San Juan County Commission, said past drilling around his town of Montezuma Creek left toxins in the ground and water. Utah state officials endorsed Tuesday’s sale. “Responsible oil and gas development is critically important to the economy of southeastern Utah and the state as a whole, and the successful lease sale of all 29 parcels included in the [environmental assessment] will have a tremendous impact towards creating jobs in the region and lowering administrative obstacles to sustainable development,” Utah’s public lands policy director Kathleen Clarke wrote in the state’s official comments. But preservationists say “responsible” development is not possible unless the BLM conducts a more complete survey of these lands’ archaeological features. Doing otherwise would mean the agency is “flying blind” and will not be able to attach conditions to the leases that would ensure drilling takes place in an optimal manner, according to Barb Pahl of the National Trust for Historic Preservation, which is contesting the sale along with Friends of Cedar Mesa and the Southern Utah Wilderness Alliance. The groups are formally challenging the BLM’s finding that leasing would result in “no adverse effects” to historic properties. In a formal opinion sought by Porter, the Advisory Council of Historic Preservation backed the BLM’s conclusion that issuing leases would not harm sensitive sites as long as ground-disturbing activities are properly controlled. But the council “also cautioned that a blanket determination of ‘no adverse effect’ would not be appropriate in all lease sale cases.” Parcels with important historic value, it said, will require additional study. Leasing does not authorize drilling or other surface-disturbing work on the parcels, which is subject to further analysis of specific sites. But leasing does obligate the BLM to accommodate industry access to mineral resources that might lie under ruins, graves, rock art and other remnants of ancient habitation. For parcels on Alkali Ridge and Montezuma Canyon, preservation groups insist BLM must go further and impose “no surface occupancy” restrictions, meaning the minerals would have to be accessed from less sensitive lands with directional drilling. Pahl, with the National Trust for Historic Preservation, complained the BLM is “building uncertainty” into the leasing process that could spell trouble for energy developers down the road. The National Park Service also asked BLM to defer leasing of 13 parcels within 15 miles of Hovenweep, recently designated an International Dark Sky Park. Some of the parcels even abut Colorado’s Canyon of Ancients and are so rich in archaeology that many argue that they should have been included in the monument designated in 2000 by President Bill Clinton. All parcels offered Tuesday received bids in excess of the BLM’s $2-per-acre minimum, reaping nearly $1.5 million, plus rental and administrative fees. One company, Ayers Energy LLC of Bedford, Texas, was the high bidder on 19 of the most sensitive parcels. The BLM won’t issue the leases, however, until it resolves protests filed by four different groups.